I love that we all have clarity about the importance of change. But what happens when the change actually shows up in our lives? When it knocks on your door? Or just comes like a bulldozer and runs you over? We want to welcome change. To treat it like an honored guest then send it on its merry way. But here is where we miss the point. We are not here to serve change. 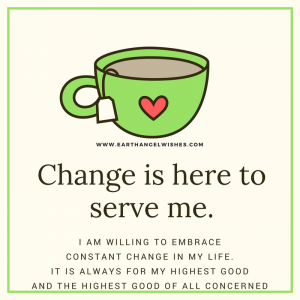 CHANGE IS HERE TO SERVE US! And so to prep us for the gifts that come with change, change likes to show up unannounced. Or in disguise. It loves to play the game of illusion. When we INTEND and KNOW that change is always for our highest good (and for the highest good of all concerned) then we can drop the game that our ego wants to play. We no longer need to project the worse, or worry about things that never actually happened or will ever happen. We move into a space of actually taking one step after the other. And exploring your choices and your resistance to making different choices because of the change that is happening in your life. What that essentially means is that your life no longer falls apart, but falls into place. It comes together connecting your purpose, and mission, with your vision, heart and mindset. You become one with all parts of you. Because sometimes if we were previewed to all the details of our path before we took a step, we may back down in fear, thinking we could never do that! But….you should know enough to know if the movie is worth watching. Here is where your intuition guides you when you are in the space of uncertainty. Each moment of your life is meant to be used to ride a particular energy wave. This is me, summarizing the gift and awareness when embracing change. I’d love to hear what was your take-away! And since money is a key component in how you process change. Here is my gift to you. click here to download my free money affirmations video that you can use daily to drop the resistance you have around attracting more money into your reality.